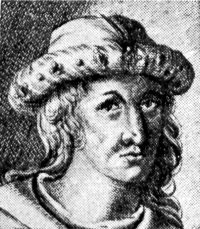 Robert III (Scots Gaelic: Raibeart III; 14 August 1337 – 4 Aprile 1406), born John Stewart, wis Keeng o Scots frae 1390 tae his daith. He wis kent primarily as the Earl o Carrick afore ascendin the throne at age 53. He wis the eldest son o Robert II an Elizabeth Mure an wis legitimatit wi the mairiage o his parents in 1347. This page wis last eeditit on 18 Dizember 2017, at 02:24.